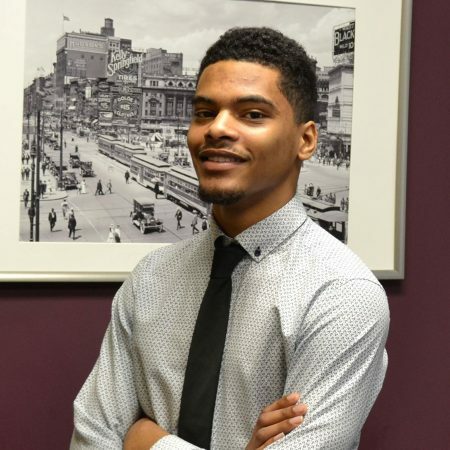 As a senior at Cornerstone Health + Technology, Terrell had big dreams for his future, but needed a little help from business mentors to achieve his goals. His Winning Futures mentor Michael Wooley, senior director of business development at FLEX Automotive, helped Terrell understand the importance of building professional relationships, and took him to a sales meeting to see that side of business. Terrell’s classroom facilitator, Carla Wellborn, program director for Winning Futures, helped connect Terrell with the Grand Circus Coding Bootcamp in 2018, where he became certified in software development. Today, Terrell works as an executive assistant at Porter Media Group and owns his own company, Innovative Choice, a web development and consulting company. His ultimate goal is to be the CEO of a Fortune 500 company.